Amy's Creative Pursuits: She's a Free Bird! Last weekend we attended a graduation party for a young lady at our church and this was the card I made for her. 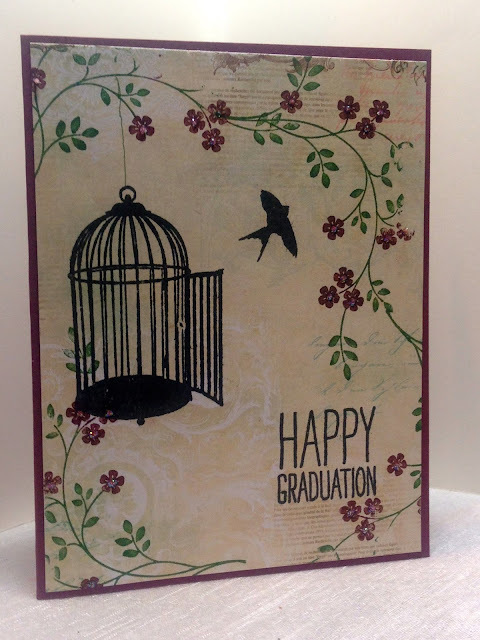 I used the same Penny Black stamp set "For the Grad" that I used on my son's card. If you missed his graduation card, you can see it HERE. I love this Penny Black image because it is so simple and easy to use: no coloring involved! Just stamp and go! Because my card was for a girl, I added some feminine elements by using the retired Stampin Up! flower branch image from the 'Thoughts and Prayers' set. I simply stamped all the images directly onto designer paper by Bo Bunny (The Gabrielle Collection). Then I added Stitckles to all the flower centers. The card base is Bravo Burgundy. The inside of the cards reads 'Your Free!'. A great card Amy. Love how you combined the SU set with the fun graduation set. I am not normally a huge fan of bird cages, because most of the time the bird is inside the cage, but this set by Penny Black is so clever and perfect for graduation. What a cool concept for a graduation card!! It turned out beautifully and I love the colors you chose, especially for the flowers! Oh so nice card ! !